On the evening of Monday, November 13th, the Martina Arroyo Foundation held its 13th Annual Gala at the JW Marriott Essex House in New York City. 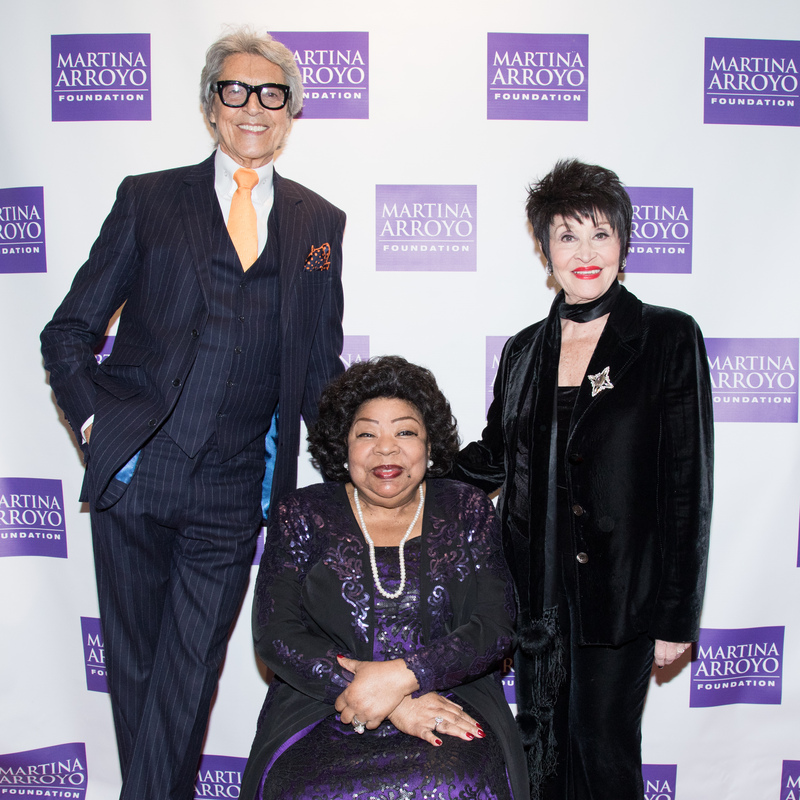 Martina Arroyo’s great appeal not only makes it an occasion of great singing but also has outreach to Broadway and fashion as well. It truly is a night that both glitters and sings! 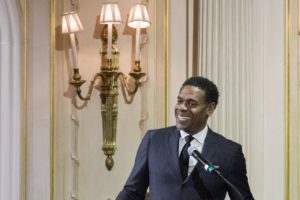 Terrance McKnight was the excellent host and is known through his unique charm hosting classical music on WQXR radio and his Langston Hughes program “I, Too, sing America.” He is a producer of several music programs for public radio and is also an esteemed professor at Morehouse College. In 2010, he was honored with an ASCAP Deems Taylor Radio Broadcast Award. 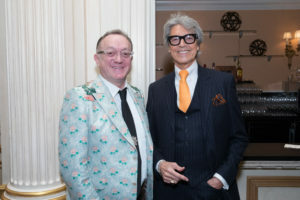 Honorary Gala Chair, the exuberant Andrew Marin-Weber, resplendent in his festive floral jacket, kept an eye on the fabulous bustling crowd while pianist Eric Yves Garcia played beautiful romantic music for the guests. Martina Arroyo was escorted to the stage where she thanked all for attending and mentioned the sad passing of Joan Krueger “2004 Coach of the Year” which was noted in the beautiful souvenir program. 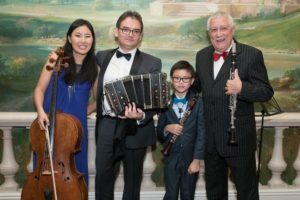 The first honoree was famed bass-baritone James Morris who recently sang his 1,000th performance at The Metropolitan Opera. Mr. Morris was introduced by Gala Chair Garry Spector who described Morris’s long career and friendship with Martina Arroyo. His performances in Verdi, Puccini and Wagner are legendary and his debut in Aida in 1973 placed him with Martina Arroyo as Aida. They go back far but remain near. Mr. Morris studied with the great American soprano, the immortal Rosa Ponselle. 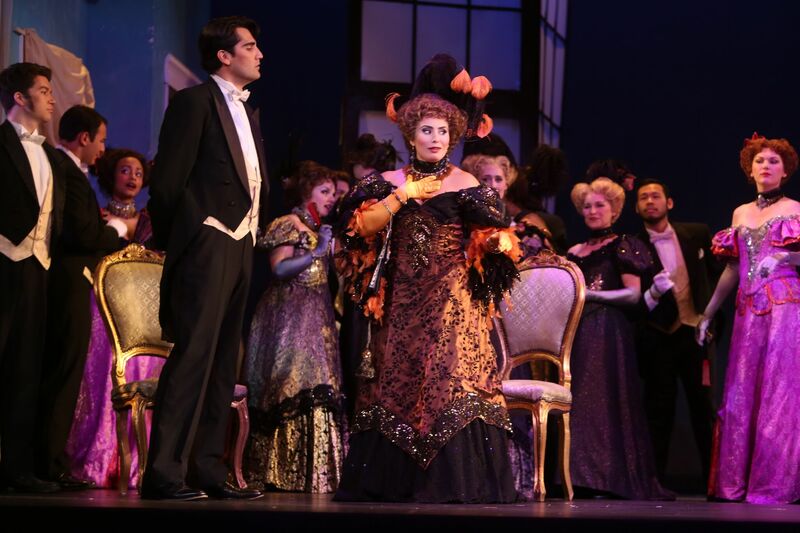 She made her debut at age 22 with Enrico Caruso and Giuseppe De Luca at the Metropolitan Opera in 1919 in Verdi’s La Forza del Destino. James Morris spoke eloquently of Martina Arroyo and her extraordinary work on behalf of young singers of today through her Prelude to Performance series. Mr. Spector was an energizing host with knowledge and humor and with a special affinity towards his formidable and kindly subject. 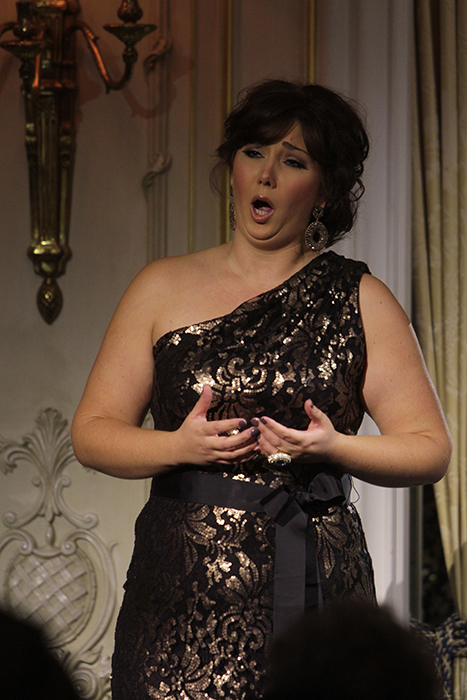 The second award went to soprano star Ailyn Pérez. Ms. Pérez was hailed by the New York Times as “a beautiful woman who commands the stage and she is a major soprano.” Ms. Pérez humbly accepted her award from board member Gary Spector and appeared to be ready for her great future. She spoke of “time being of the essence for a career and being in the right place at the right time.” She has the beauty of Rita Hayworth and the voice of an angel and one wishes to have been present at her La Scala debut as Violetta in La Traviata and her peerless Mimi in La Bohème. 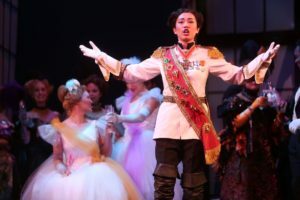 Her Liu in Turandot at the Royal Opera in London and her Thais and Juliette at the Metropolitan Opera were ambrosia to fans thirsty for such a sumptuous sound coming from an oasis of Latina beauty. Ms. Pérez is a Chicago native, the daughter of Mexican immigrants. Her album debut is “Poeme d’un jour” a program of French and Italian songs on Opus Arte label. She was a winner of the Richard Tucker award in 2012, the only Hispanic to do so in 35 years. Two Prelude to Performance artists sang. 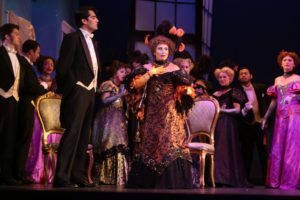 Rising soprano Jessica Sandidge sang “E strano …Ah, fors’ è lui” and “Sempre libera” from La Traviata by Giuseppe Verdi. Ms. Sandidge reminded one of several stunning Violetta’s at the Met Opera decades ago including Mary Costa and Anna Moffo and television’s Marguerite Piazza who were blessed with beauty, stage presence and voice. She sang with lyric charm and dramatic coloring and nailed the high note in “Sempre libera.” Her excellent accompanist was Maestro Steven M. Crawford who has conducted several New York City premieres including A Chekhov Trilogy by composer Richard Wargo. Mr. Wago is also curator of the Marcella Sembrich Museum on the banks of Lake George in upstate New York. Bass DeAndre Simmons & Soprano Jessica Sandidge. Mr. McKnight then introduced bass DeAndre Simmons, who sang “Il Lacerato Spirito” from Verdi’s Simon Boccanegra accompanied by Maestro Steven M. Crawford. 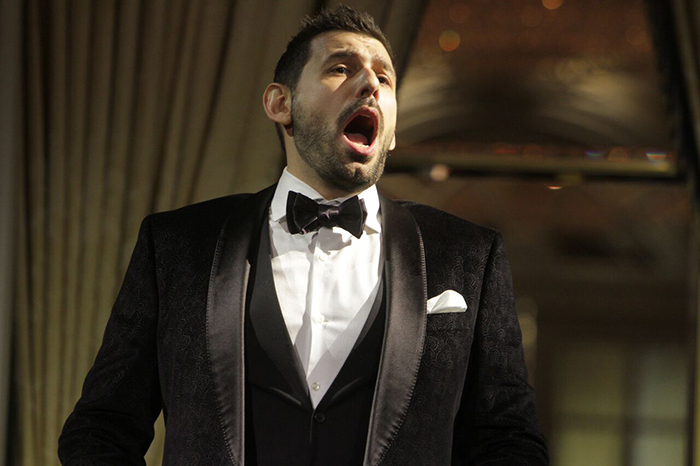 Mr. Simmons has earned a reputation worldwide for his vocal appearances including singing for royalty, U.S. Presidents and Pope John Paul II. The aria is mighty and imposing. Mr. Simmons’s voice is currently a bit too high for this majestic undertaking. If he waits several years his basso will darken further. Perhaps “Non piu Andrai” from The Marriage of Figaro would have shown him at his very best. Nonetheless, DeAndre Simmons’s voice, personality and spirit are there in abundance and his stage presence is most ingratiating. A delicious steak dinner was served followed by a “live” auction hosted by auctioneer Katie Jacobs who has been benefit auctioneer for Christie’s Auction House since 2007. She is also a wine connoisseur and manages Christie’s luxury online auctions globally from wines to jewelry and watches. Who could resist two tickets for Hamilton, lunch for six at Martina Arroyo’s house, beautiful jewelry or a week-long trip to London? Martina Arroyo presented the Michel Maurel award, named after her late husband to Martin L. Jeiven. The Martina Arroyo Foundation thanked Marty Jeiven and Anatoli Jewelry for their generous donation to The Martina Arroyo Diva Jewelry Collection. 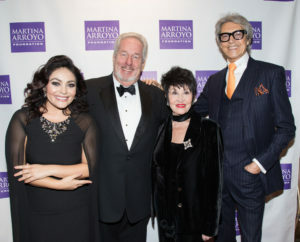 Dona Vaughan, Artistic Director of Opera at Manhattan School of Music, made the presentation to honoree, famed dancer/choreographer Tommy Tune. Tommy Tune has won Astaire awards, Tony awards and is truly a Broadway legend. Despite his height, tall Tommy can “float like a butterfly” and is a Ferrari on his feet! He accepted his award and told the audience that he has always been an opera fan and saw LULU three times as a novice! He mentioned a dinner he had early in his career with the great actor Sir Laurence Olivier who tried to answer the gnawing question, “Why do we do what we do? Is it narcissism? 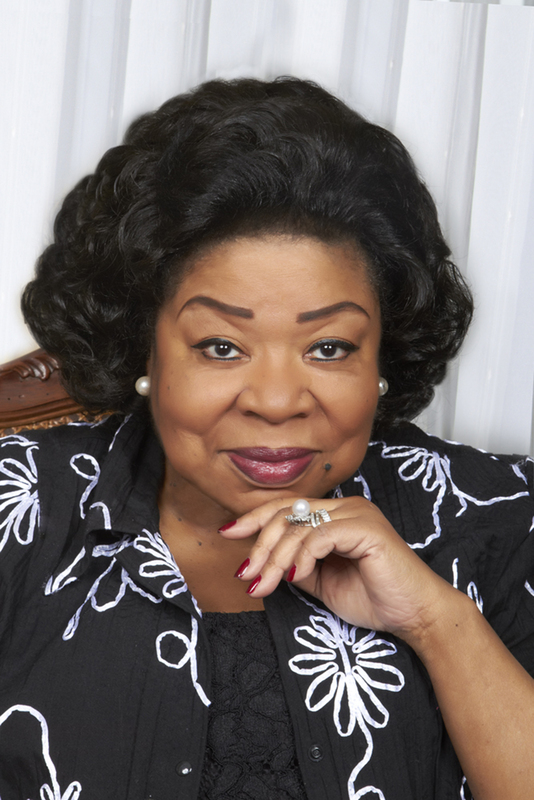 Whatever it is – it’s all alright!” Tommy then praised Martina Arroyo for all she has done and continues to do in helping young singers achieve their operatic goals. 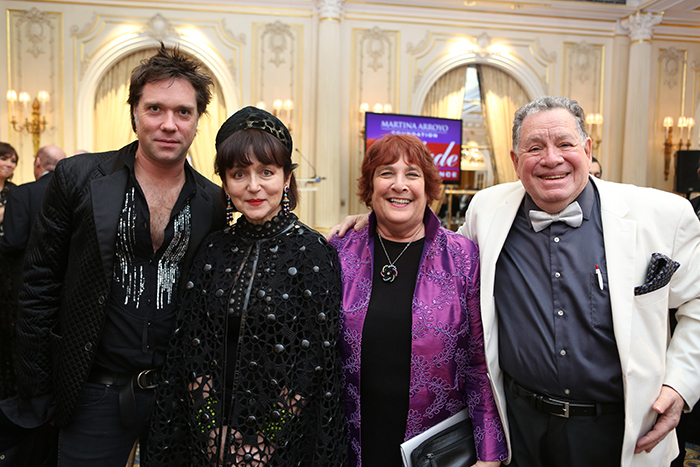 Ron Raines, Dona Vaughn’s husband and television, musical and Broadway actor, introduced the next honoree, the legendary Chita Rivera. A double dose of “something wonderful.” Ms. Rivera told the audience how her parents encouraged her in her dancing in Puerto Rico leading to her career in Call Me Madame and Nine with Antonio Banderas and West Side Story. She met composer conductor Leonard Bernstein who asked her to sing and he chuckled at her efforts. She exclaimed, “after all NOT all dancers can sing” but she did O.K. Her fabulous career on stage and in film has led to many awards and adventures and to the Presidential Award of Freedom in 2009. Her comments “God has been very good to me” are a reflection of her inner spirit which gives her super grit and talent with a reflective and humbling edge! 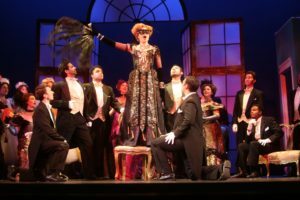 Tommy Tune and Chita Rivera are touring with their show “Chita and Tune.” Ms. Daniele, a famed choreographer who venerates both legends, told the audience her own love of theatre combined with luck, gave her all she wanted in her notable career. 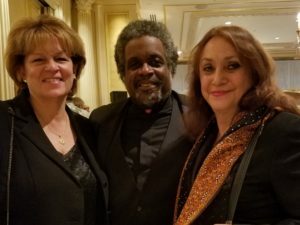 Terrance McKnight made his closing remarks and introduced the great jazz saxophonist & clarinetist Paquito D’Rivera with Daniel Freiberg accompanist. 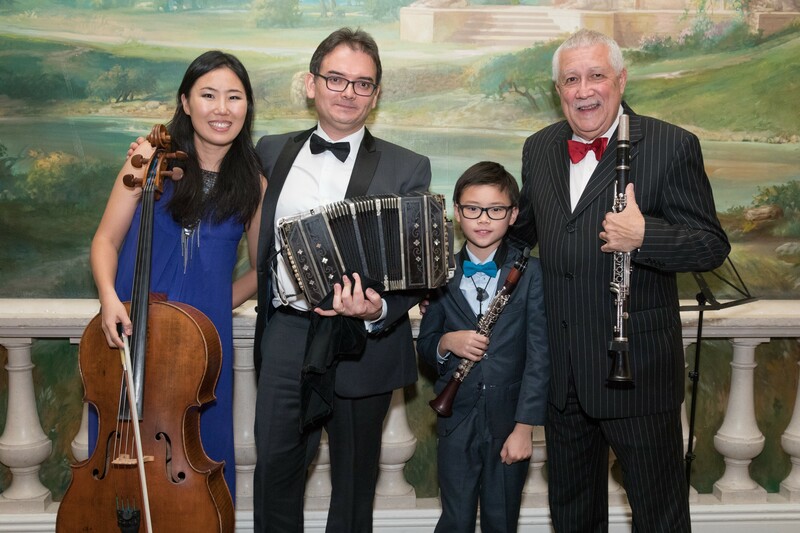 Paquito’s ensemble which featured cellist Jisoo Ok, bandoneonist Hector Del Curto and his eight year old son Santiago Del Curto, a clarinet player, who performed with enthusiasm and played royally. Paquito is a composer of some enchanting jazz compositions and his heart, generous personality and inspired spirit can liven up any party. Brio Latino! Ole! The great lady herself, Martina Arroyo appeared, resplendent in regal purple attire who always sends her greetings to her Brooklyn Eagle (Discovery) admirers. 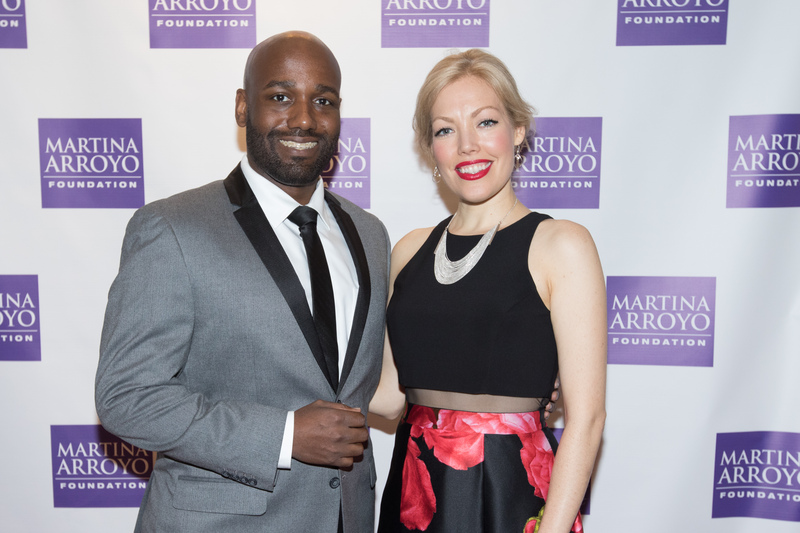 Her Dad Demitrio worked as an engineer at the Brooklyn Navy Yard to help her succeed in her operatic yearnings. Despite fine dining since then, Martina’s memories of hot dogs at Ebbets Field with her Dad still pop up and entice! It was nice to meet and greet so many friends and acquaintances. 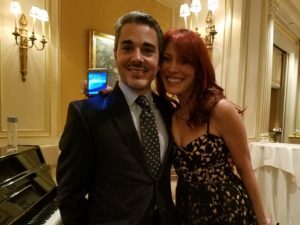 Mark and Sadie Rucker, the dynamic duo who always make the world seem brighter, through his glorious baritone and her pianistic accompaniment and their efforts towards making Prelude to Performance the wonderful success that it has become. Also great to greet Gala Producer the sparkling Norena Barbella and Deborah Surdi, Administrative Director from the Gala Committee (Deborah is from my old neighborhood of Bensonhurst, Brooklyn) who made this an exciting event. At our table was Stephen De Maio, esteemed Advisory Board member and much respected President of the Gerda Lissner Foundation, the formidable Michael Fornabiao, Treasurer of the Gerda Lissner Foundation, Eve Queler, great Maestro from The Opera Orchestra of New York, ever charming Gloria Gari from the Giulio Gari Foundation and Gari Treasurer Lud Mayleas as well as enchanting fellow opera enthusiasts Louise Simmons and Robert Funk. It was nice to chat with the radiant Advisory Board Member Midge Woolsey and her husband economist Dr. Juergen “Jerry” Stolt, Opera Index Treasurer and Broadway investors Murray Rosenthal and composer Philip Hagemann, Opera Index Vice President Janet Stovin, also from Opera Index Robert Steiner and Faith Pleasanton, Career Bridges glamorous couple Barbara Meister Bender and husband David, opera manager Robert Lombardo, financial consultant and excellent chef Paolo Petrini, Anthony Laciura Met Opera tenor, actor and fellow Sicilian, poet scholar Cavaliere Dr. Edward Jackson and fellow writer the esteemed Meche Kroop. 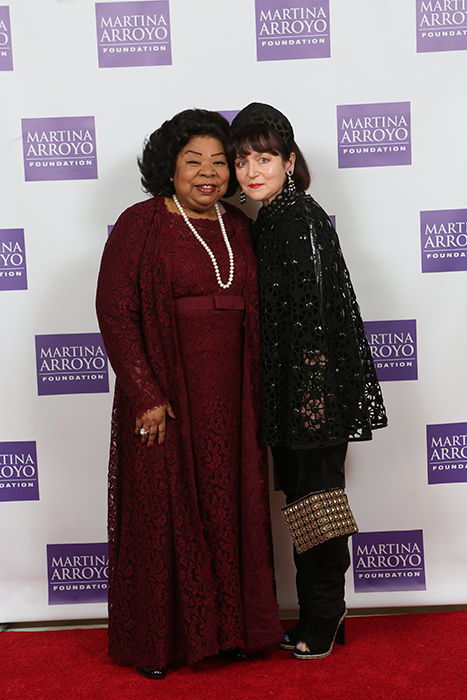 The Martina Arroyo Gala is among the treasures of New York. It is now a wonderful memory and if we ever have a “dull” moment, Judy and I will pause and remember the fun! 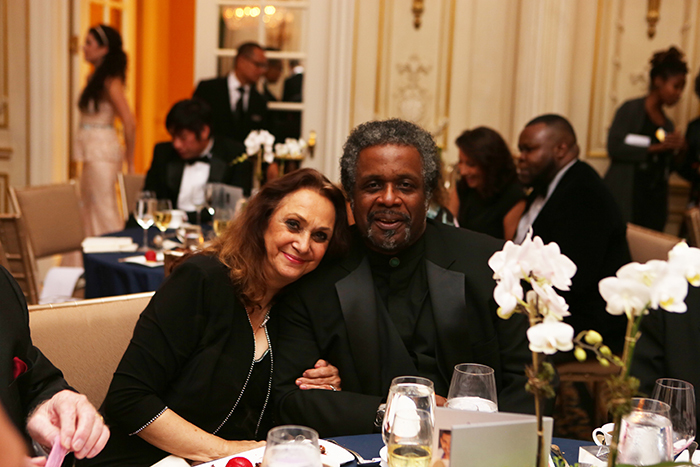 We “honeymooned” at the Essex House in 1966 and we add more golden memories at the Martina Arroyo Gala in 2017.